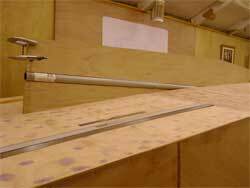 This month sees a surge in boat building progress with the start of the keel. 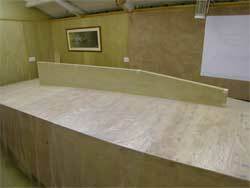 Saturday 10:00 Jewsons, returning with a sheet of 12mm marine ply. Sounds like a late start but a late Friday night turned into an early Saturday morning, all in aid of a good cause of course. But with another event on Sunday night you have to pace yourself. This one sheet will produce 4 keel laminations. 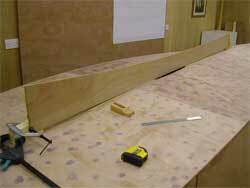 The first step is to halve the board and mark out two keel shapes on the top board. 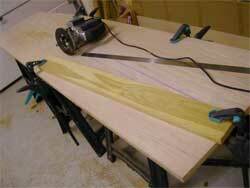 Then trim them and stack and match them with the router. 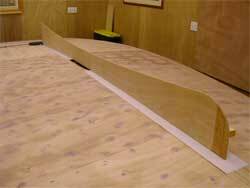 The keel will eventually need 2 more 6mm laminations giving a total thickness of 60mm. The next job is to mark a hull profile template off the boat and carefully cut to the line with the jigsaw. Then with some sticky backed sandpaper on the hull, sand the template for a perfect match. 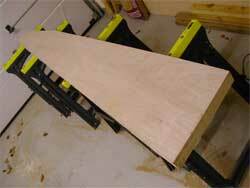 Transfer this profile to the keel laminations, rough cut then copy router using the template. 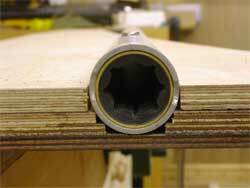 Next job was to cut out the sterntube section from the central 24mm of the keel; That is the inner 2 x 12mm plies. Here it is all lined up on the hull. Some small adjustment was required but I was pleasantly surprised how little. I've some small tooling tasks to ensure the sterntube is properly located in the keel before I can bond the whole lot in place next month.